Turkey's Foreign Minister Ahmet Davutoğlu grandiloquently proclaimed a few days ago that, "If the world is on fire, Turkey is the firefighter. Turkey is assuming the leading role for stability in the Middle East." Such ambition is new for Ankara. In the 1990s, it contentedly fulfilled its NATO obligations and followed Washington's lead. Starting about 1996, relations with Israel blossomed. In all, Turkish policy offered an attractive exception to the tyrannical, Islamist, and conspiracist mentality generally dominating Muslim peoples. That the country's political leaders were corrupt and fumbling seemed of little consequence. Those faults, however, proved extremely consequential, leading to the repudiation of long-established political parties and the victory of an Islamist party, Adalet ve Kalkınma Partisi (AKP), in the elections of November 2002. By March 2003, in advance of the coming war in Iraq, the new government signaled that a new era had begun by refusing to permit American troops to traverse Turkish territory. Over the next eight years, Turkish foreign policy become increasingly hostile to the West in general, the United States, France, Israel in particular, even as it warmed to governments in Syria, Iran, and Libya. This shift became particularly evident in May 2010, when Ankara both helped Tehran avoid sanctions for its nuclear program and injured Israel's reputation with the Mavi Marmara-led flotilla. 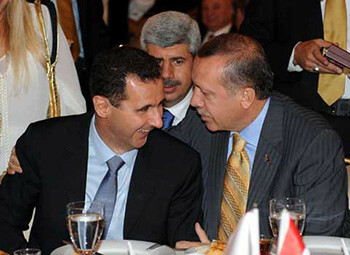 Erdoğan conferring with a pleased al-Assad. Providing a model: The Turkish president, Abdullah Gül, holds that Turkey can have a "great and unbelievable positive effect" on the Middle East – and he has some takers. For example, Rached Ghannouchi, leader of Tunisia's newly legalized Ennahda movement, has stated: "We are learning from the experience of Turkey, especially the peace that has been reached in the country between Islam and modernity." Offering an economic lifeline to Iran: Gül paid a state visit to Tehran in February, accompanied by a large group of businessmen, capping an evolution whereby, according to the Jamestown Foundation, "Turkey is becoming a major [economic] lifeline for Iran." 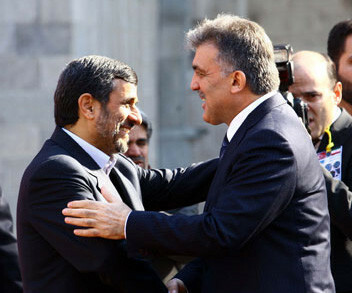 In addition, Gül praised the Iranian political system. Obstructing foreign efforts in Libya: Starting on March 2, the Turkish government objected to any military intervention against Mu'ammar al-Qaddafi's regime. "Foreign interventions, especially military interventions, only deepen the problem," Davutoğlu put it on March 14, perhaps worrying about a similar intervention to protect Kurds in eastern Turkey. When military operations began on March 19, Turkish forces did not take part. Turkish opposition delayed NATO's engagement in Libya until March 31 and then freighted it with conditions. Supporting Qaddafi: Turkey's Prime Minister Recep Tayyip Erdoğan helped Qaddafi by issuing both demagogic proclamations ("Turkey will never be a party that points a gun at the Libyan people") and practical proposals (e.g., that Qaddafi salvage his rule by appointing a president). Ankara also offered, according to Hürriyet newspaper "to be involved in the distribution of humanitarian aid in Libya, to manage the Benghazi airport and to deploy naval forces to control the area between Benghazi and the Greek island of Crete." In gratitude, Qaddafi replied, "We are all Ottomans." In contrast, Libyan rebels fumed at and marched against the Turkish government. 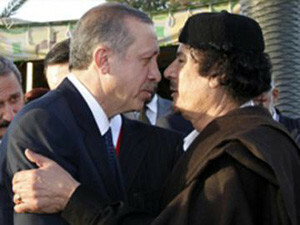 Erdoğan could hardly get closer to al-Qaddafi. Helping Damascus: In January, Ankara agreed to train Syrian troops; in March, Erdoğan publicly advised Syria's President Bashar al-Assad how to maintain power, perhaps fearful that Syria's 1.4 million Kurds might win more autonomy and cause unrest among Turkey's approximately 15 million Kurds. Anti-Zionism: Ankara has emerged as the leader in delegitimizing Israel. Davutoğlu tries to unify its enemies while predicting Israel's disappearance; a government-affiliated organization plans a new Gaza "freedom" flotilla with at least 15 ships taking part; and the deputy prime minister calls for a Libya-style bombing of Israel. Ankara's ambitions must be checked. Less provocatively and more intelligently than the Iranian regime, it aspires to reshape Muslim countries in its Islamist image. The opening salvos of this effort have gone well, being both effective and largely unnoticed. Possible methods to block AKP influence include: expressing displeasure with Ankara's "neo-Ottomanist" policies; publicly questioning whether Turkish actions are compatible with NATO membership; quietly encouraging opposition parties in the country's June 2011 elections; and, at this moment of AKP hostility and of Kurdish uprisings in eastern Turkey, reconsidering the delicate question of Kurdish civil rights.